In the technology-enabled workplace, skills such as creativity, critical thinking, collaboration, and communication (known as the 4Cs) are becoming increasingly important. Add to that character traits such as curiosity, courage, leadership, and ethics, and tie in an imperative for having a growth mindset, and it’s clear that what might have been considered sufficient for people in the past won’t suffice for the future. And neither will traditional methods of education. Traditional education, both in the classroom and through basic e-learning, falls short because it takes an inherently “one-size-fits-all” approach, exposing all learners to the same material and content, regardless of each person’s individual experiences, prior knowledge, and background. No matter if someone has already mastered the material (and therefore is both bored and fatigued by unnecessary repetition) or is struggling and needs additional reinforcement, traditional education does little or nothing to serve these learners as individuals. The result is inefficiency and ineffectiveness, creating bottlenecks in the delivery of much-needed knowledge and skills. The science is clear: Adaptive learning that combines the latest in computer science with cognitive research can deliver personalized learning at scale across a population of learners. In other words, “mass customization” that has transformed the ability of other industries to respond to individualized needs can and must transform education. Adaptive learning mimics the best model that has been proven over the years: the classic tutor-and-pupil interaction which, as Benjamin Bloom demonstrated, can dramatically increase learning effectiveness compared to the traditional classroom. Tutoring improves average performance among virtually all learners, and the achievement curve among people is much tighter. One-on-one tutoring, however, is not feasible at scale, but other solutions are. Advanced adaptive learning systems that take a highly personalized approach with each and every learner mimic the personal, master coach—and at scale. Even with its personalized approach, adaptive learning cannot and should not address the entire need for increased knowledge, skills, and character. A combination of human teachers plus technology, in a blended learning environment, brings out the best of both: The teacher who interacts with, motivates, and encourages students, and adaptive learning technology that adapts to the learner (and not the other way around). 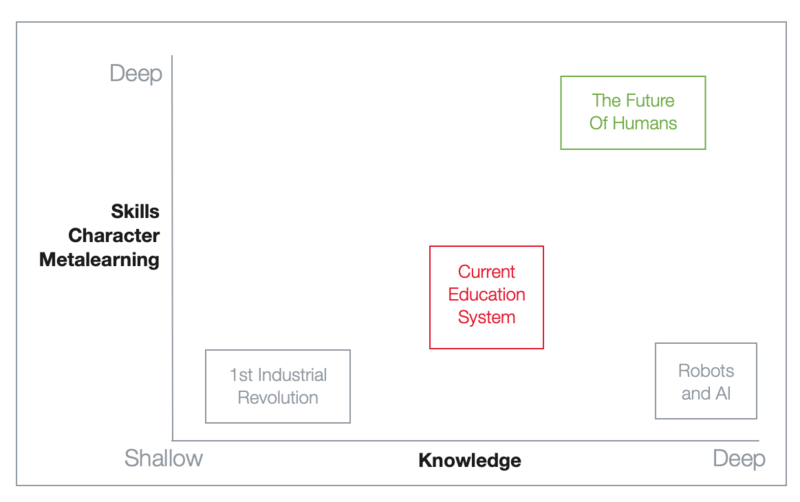 The current education system is misaligned with the needs of delivering the knowledge and skills that humans will need in the future to thrive in a technology-enabled workplace. Measurable and outcomes-based, adaptive learning is geared toward improving job performance through mastery and maintenance of knowledge and skills, rather than the mere completion of a course or online lesson. By taking a personalized approach, adaptive learning engages learners and helps them achieve proficiency quickly—often achieving proficiency in half the time compared to other learning methods. Such efficiency results from taking a “questions-first” approach, probing what learners already know and where they have knowledge gaps. This also raises self-awareness and uncovers misconceptions—that is, where learners are “unconsciously incompetent,” a pervasive problem in which people believe they know something but, in fact, do not. Our data show that employees can be as much as 20-40% unconsciously incompetent in areas that are critical to their job performance. With adaptive learning, there is a general theme around what must be learned, but no set “map” for the lesson or sequence of presenting material. What the learner grasps first makes no difference, whether that means skipping ahead to what the learner has not studied, reverting to what the learner comprehends more easily, or taking a more linear approach. A significant advantage of the efficiencies gained through adaptive learning is to allow learning to occur in multiple dimensions, specifically in the four dimensions as defined by Charles Fadel, founder of the Center for Curriculum Redesign. 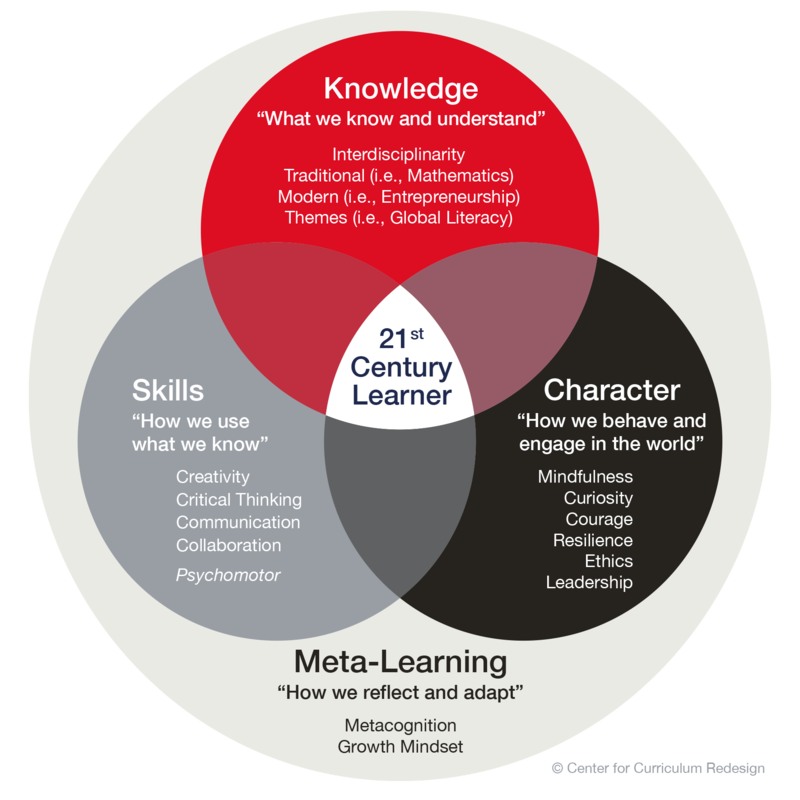 The four dimensions are knowledge, skills, character, and meta-learning (i.e., learning how to learn). Four-dimensional adaptive learning can enhance the impact of each dimension; for example, it can reduce the time needed for knowledge acquisition, while also facilitating and supporting in-person learning situations such as project-based learning, small groups, or even classroom instruction. Traditionally, most of education is focused on the first dimension, endeavoring to ensure that learners at all levels (K-12, post-secondary, and corporate L&D) have the requisite knowledge they need to perform a task or to acquire other knowledge. Furthermore, every task or job has a baseline of knowledge that become so engrained and accessible, it is “second nature” to the person—whether the musician who can sight read music, the person at the computer keyboard who does not need to think about the arrangement of the keys, or even the pilot who can execute evasive action to avoid a mid-air crash. Such knowledge is called “automaticity,” requiring a high degree of competence and confidence. We suspect based on the extensive cognitive task analysis and observation of learners solving problems that the need for automaticity could be substantial. With so much knowledge to be gained, other dimensions such as skills and character are often glossed over or unaddressed. Adaptive learning, however, can bring learners to a state of competency efficiently and effectively, which allows for more time to be devoted to other dimensions. In this way, adaptive learning can ensure that skill development is not done at the expense of knowledge mastery. Four skills have been identified by Fadel and his team as being key to success in the 21st century workplace: creativity, collaboration, communication, and critical thinking (4Cs). More recently, Fadel added psychomotor skills (both gross motor and fine) that enhance each person’s contribution to the 21st century workplace. These skills elevate the role of the human, particularly to take on more complex jobs as automation and robotics make continued in-roads elsewhere, including to eliminate some lower-level jobs. The third dimension of character development is defined in six areas: courage, curiosity, mindfulness, resilience, ethics, and leadership. Skill and character development can occur in many ways, including through coaching and stretch assignments in the workplace, as well as with adaptive learning modules that are highly targeted to specific skills and attributes. The result is a blended approach, in which teachers and mentors are complemented—not replaced—by technology. Underlying knowledge, skill and character building is meta-learning—the capability for self-reflection and personal growth. Adaptive learning incorporates techniques that develop meta-learning and promote lifelong learning. It’s a tall order, arguably well beyond the capabilities of traditional education. But by taking an adaptive learning approach in a blended environment of teacher plus technology, it becomes far more efficient and effective to train and educate tomorrow’s workforce. They will not only have the knowledge they require to compete in the 21st century, but also benefit from development in dimensions of skills, character, and meta-learning to maximize the potential of humans in a technology-enabled world.